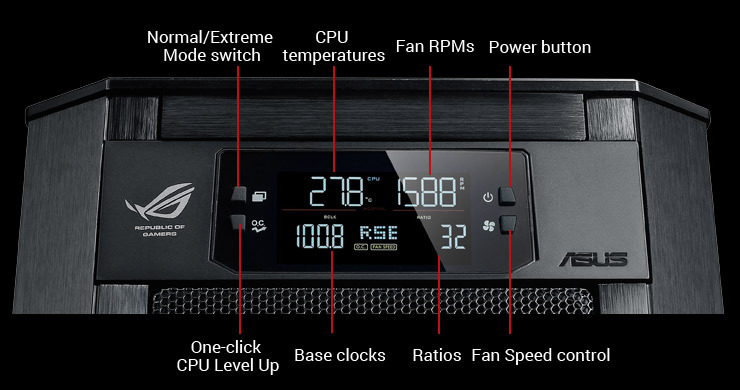 Overclock3D awarded the ASUS Rampage V Extreme their gold award. They said "Yes, it's like any quality product in that you get what you pay for, so you have to pay a little more for the many MANY features of the Rampage V Extreme, but given how expensive the i7-5960X is it would be churlish to berate it for price. The King is dead, long live the King, and he gets crowned with our OC3D Gold Award." 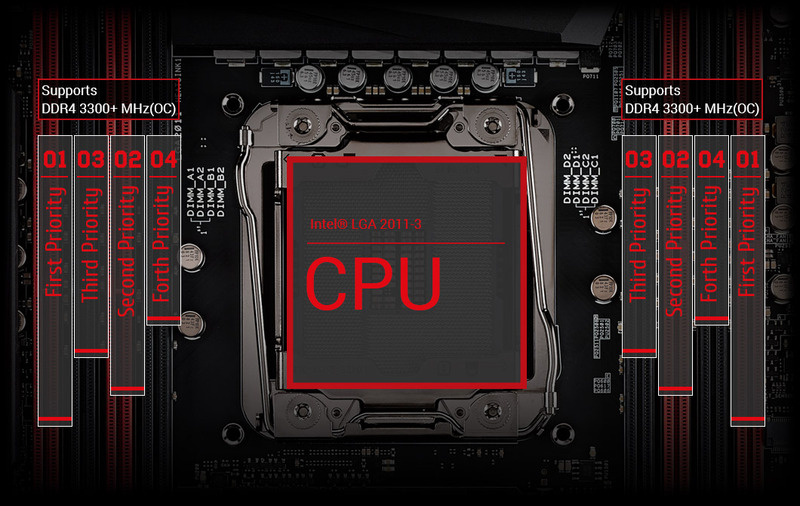 Perfect spacing and PCI Express 3.0 speed for incredible graphics! Unleash the full power of multiple graphics cards for visuals that never stutter, with just the right amount of space between each card. Onboard switches let you selectively enable or disable cards in a flash — configuring multi-GPU setups has never been easier! Drive CPU and DDR4 performance beyond the limits! This is the first platform to support DDR4 memory, and it is capable of overclocking memory up to DDR4 3300+ MHz with all eight DIMMs fully loaded! ASUS-exclusive T-Topology circuit design plus patent-pending OC Socket unleash the full potential of DDR4 by minimizing crosstalk and signal reflections. Thanks to our expertise in motherboard layout design, signal timing issues are also greatly reduced, resulting in improved stability and overall performance. ASUS works with almost every DDR4 memory vendor to ensure the best compatibility – so you're assured reliable performance from your favorite brands. Get your hands on real-time system monitoring and tweaking in two modes. For both, a clear 2.6-inch display keeps you informed and in full control — so you can maximize the available power! NORMAL MODE – easy system monitoring and performance boosts! OC Panel can be installed directly into a 5.25-inch drive bay to provide real-time monitoring of multiple vital parameters, including CPU temperature, ratios, base clock and fan speeds. The CPU Level Up button provides instant control over two-stage overclocking, while CPU fan speeds can be adjusted to Turbo, Standard and Silent modes — super-simple controls, all at your fingertips. 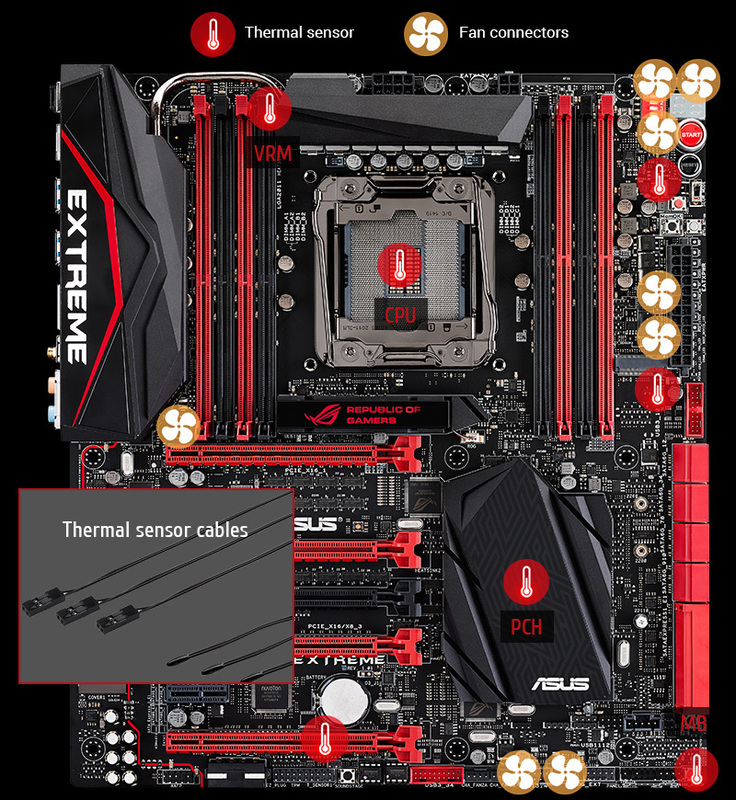 EXTREME MODE — advanced overclocking made easy! OC Panel can also be used as external overclocking console. In this mode, there are connectors and switches for exclusive ROG features including Subzero Sense, VGA SMB, VGA Hotwire, Slow Mode and Pause. You also have direct access to four-pin fans connectors – four in total! — as well as remote power and reset buttons. ROG understands overclockers better than any other manufacturer — so Rampage V Extreme includes all-new hardware-level Safe Boot and ReTry buttons to help put things right when overclocking adventures go wrong. They're quick, easy and real time-savers! One quick tap of the Safe Boot button powers off your system and launches into Safe Mode, where you can tweak your retained previous settings. 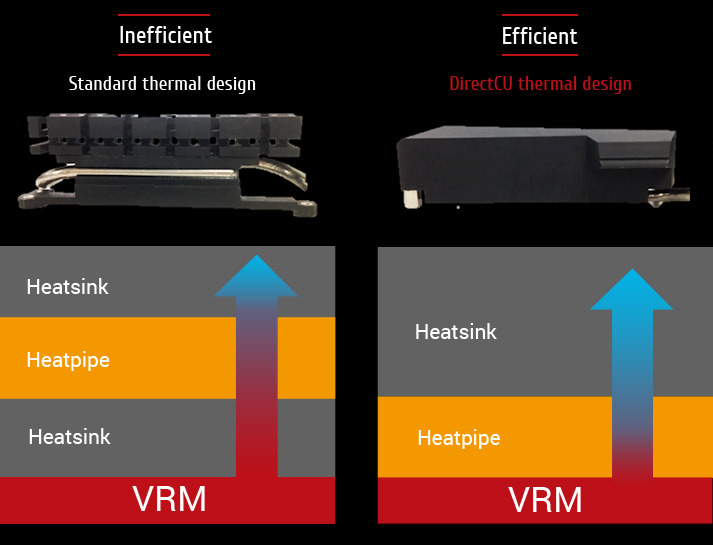 Exclusive DirectCU cooling technology puts better conductive copper heat-pipes in direct contact with Rampage V Extreme's Extreme Engine Digi+ IV VRM zone to provide incomparable heat dissipation. 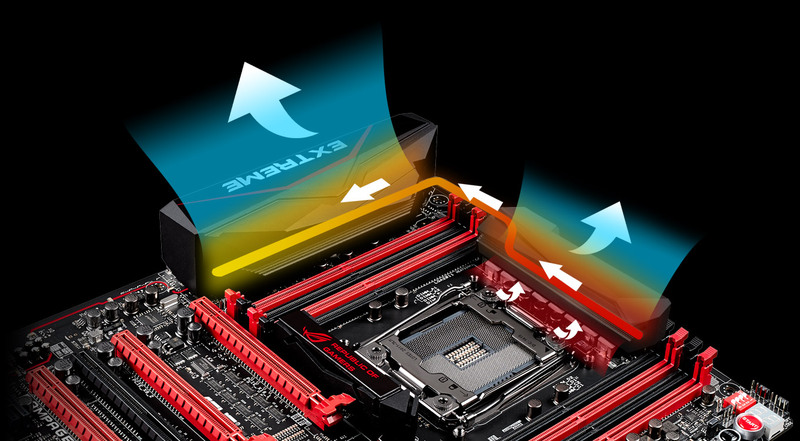 Other designs merely prevent overheating — Rampage V Extreme with DirectCU goes up to 7¢J cooler. 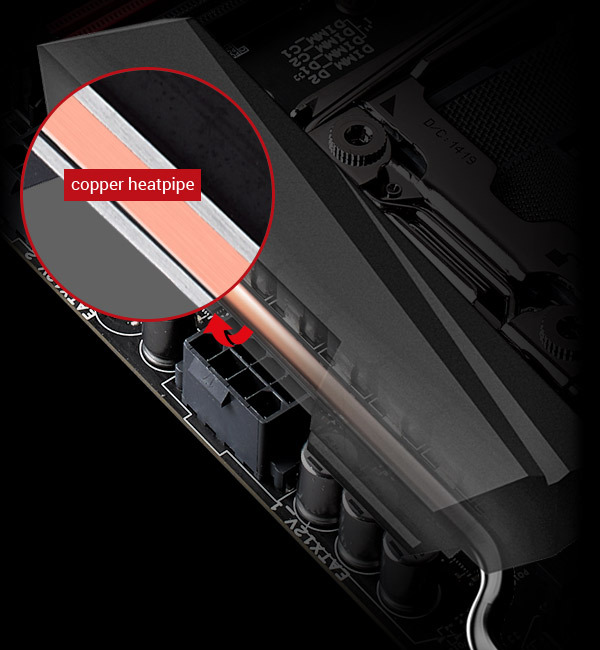 The heat coming from the chokes and VRM zone is absorbed by the copper heatpipe and then dissipated through two large aluminum heatsinks for ultimate cooling. Rampage V Extreme has 8 x 4/3-pin (PWM/DC) combo fan connectors, four intelligent onboard sensors plus three additional 2-pin headers and a selection of three thermal cables to help you monitor the temperatures of up to seven motherboard or key components in real time — so you're able to adjust CPU and case coolers automatically or manually for the best dissipation. 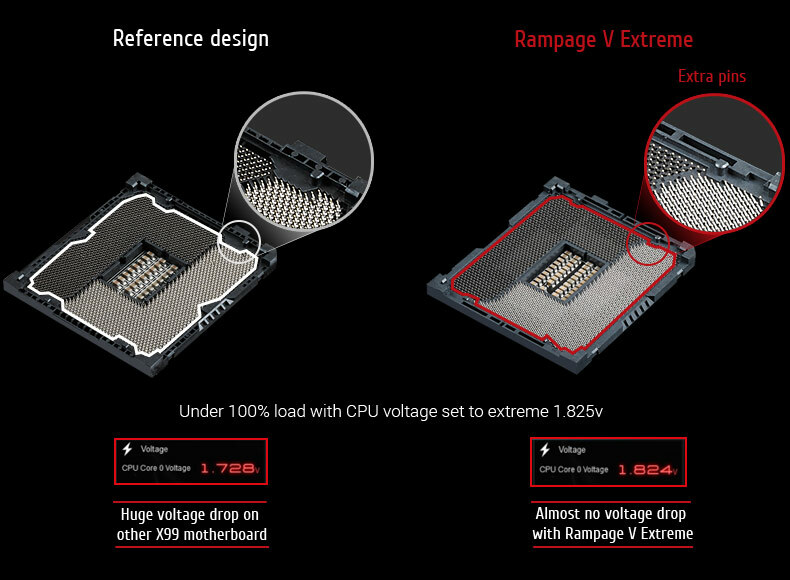 More links for "Rampage V Extreme Intel X99 (Socket 2011) DDR4 EATX Motherboard"
I love everything about this board, Everything about this board which has been said is not hype, its fact and nothing else comes close. I strayed away from Asus for quite some time since my days of using the The lga 775 striker boards as they were pretty terrible but this board has made me peel away from the ever stable EVGA boards I have been using since. Only reason I went with this board is due to many good reviews so what a better time to come back. The uefi bios is easy to use, packed with features which are very handy like the secure erase function. The board looks awesome. The only minor niggle I have is that they should have offered a version without that gimmicky oc panal which could have cut the price a little for us. Other than that I have no qualms with the board so far. Highly recommend it. Just upgraded to this from old ROG MB. It's a great board, easy to install, easy to figure out where everything fits. Looks and feels good quality. Got it running nice and fast, good recovery when you overclock and have to reset to try again. Nice bios interface, easy to use and lots and lots of options. A dream MB if you want to overclock. Only downside to this is the OC panel. The attachment at the back badly designed, so if you want to keep your ROG panel on your desk to monitor temp etc, the cable plugged into the MB keeps falling out, as the cable is too heavy for the small input on the back of the OC panel. Not an issue when inside your case. Got this board a few days ago and bought an i7 3.3ghz cpu and 16gig of Geil evo Potenza ddr4 ram. Put it all together, and I must say, that it is a very well made board. I'm running closed loop water cooling on the cpu and it needs it. Temps are higher than my old i5 2500k at 4.5ghz OC but still within a decent range (below 80c). Plenty of options and tweeks in the bios, so if you're thinking about getting this board.......Go get it! A motherboard and a half! This motherboard is not to be taken lightly. The build quality is extremely solid and the motherboard in itself is seriously feature-packed. 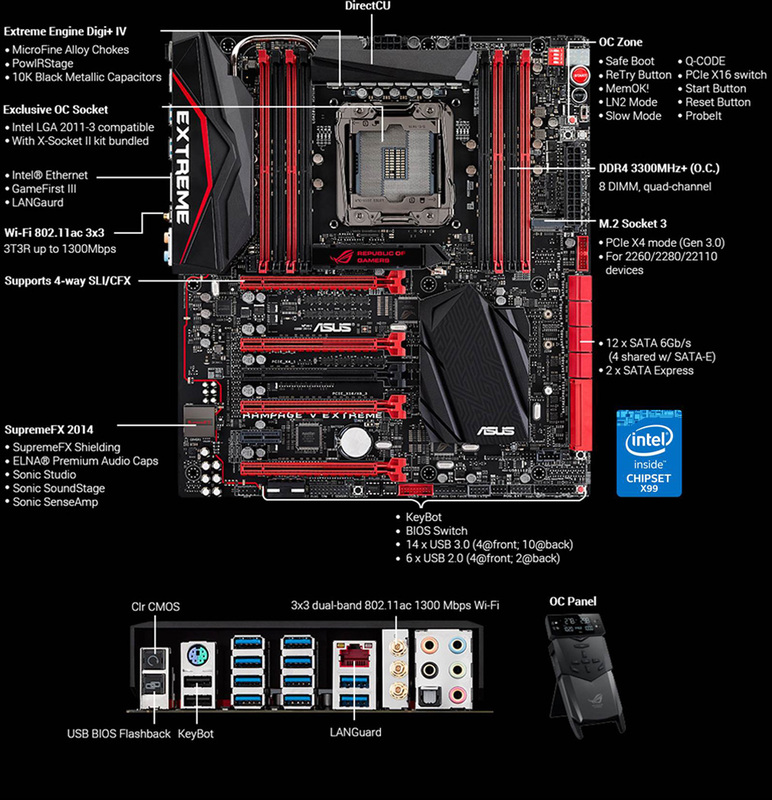 Without exaggerating, this is perhaps the best Intel X99 platform motherboard money can buy. 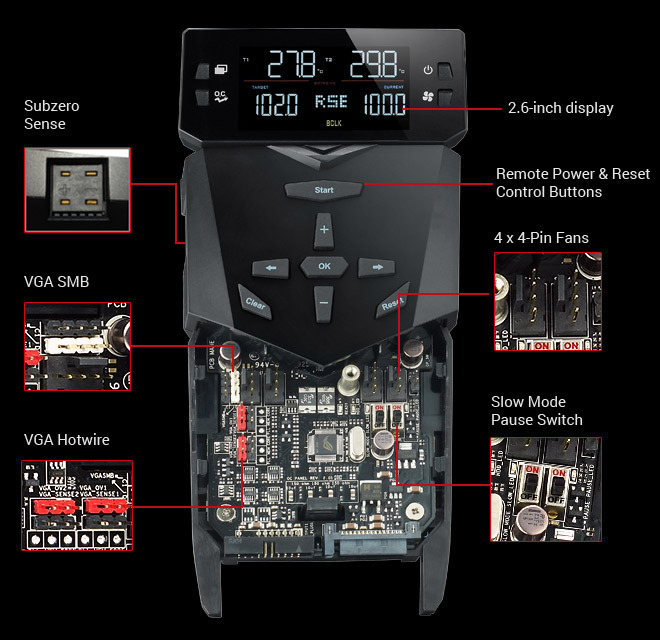 With tons of overclocking features and extra gadgets, there is no better motherboard to base your computer on. The BIOS in advanced mode is extremely powerful, providing control over just about everything you could possibly want to tweak. Overclocking-wise, the enhanced LGA2011 OC socket on this motherboard provides a stable platform for easy overclocking. After updating the BIOS to the current 0901 release, it is extremely stable with my DDR4 RAM running at 3000MHz. I'm currently running my Intel Core i7-5820K CPU at 4.375GHz with 1.29V, together with my DDR4 RAM running at 3000MHz at 1.35V. The onboard audio, Asus SupremeFX 2014, sounds fantastic. It may not beat dedicated Asus Xonar sound cards to some people's ears, but in my experience, it matches and at times exceeds the quality of my previous Asus Xonar D1 sound card. The drivers and software for this are also very good. Though they are clearly based on Realtek software, they are much improved and provide lots of extra features to enhance the audio experience. I have the onboard Bluetooth disabled but the onboard Wi-Fi is fantastic. The receiver can be placed anywhere after connecting to the antennas on the motherboard. The reception received on both 2.4GHz and 5.0GHz Wi-Fi networks is excellent, fully utilising my 50Mbps Internet connection bandwidth. Finally, the motherboard looks incredible, both from the standpoints of being extremely well built and extremely useful. I cannot recommend this motherboard enough. Solid as are all ROG boards I am very happy with it love all the features looks great in my corsair case bought my whole x99 platform from OverClockers.Onboard sound is great the overclocking features are endless the wifi is great as you don't have to screw in you just insert.Pure quality. Having just received my board i was eager to see what speeds i could get out of the M.2 slot. So now the board is built and i am currently bedding it in. I have done some initial test on the M.2 slot and SSD drives attached via the Sata express ports. The board gives you great options for booting and HDD configuration. These speeds are wonderful. the board is laid out very well and at the moment seems very solid and stable wiht the new version of the bios.